We offer the normal broad spectrum of drinks you would expect in a village inn, all at reasonable prices. We always have two real ales on tap, one light and one dark, three at busy times. There is no regular real ale. Once one cask is exhausted a different one replaces it. Customers are invited to score beers and the most popular beers return, some frequently. In a typical year, we will sample about 150 different ales. 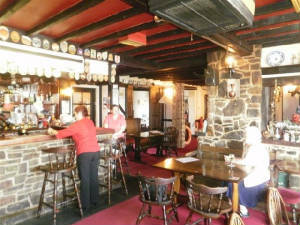 Local specialities are beers from the Gwaun Valley (Pontfaen), Harbwr and Tenby (Tenby), Mantle (Cardigan), Little Dragon(Milford), Pembrokeshire (Saundersfoot) and Bluestone(Newport, Pembs) breweries. Breconshire (Brecon), Rhymney (Dowlais) and Evan Evans (Llandeilo) also feature regularly. Our top twenty beers are listed in our annual Taberna Good Beer Guide. Our wine list details a selection of wines by the bottle or glass. In addition to bottled ciders, two keg and three‘cask’ ciders are available, the most popular being Black Rat. Other offerings include Welsh whisky and cider. The Taberna is open for drinks all day from Midday till closing time, which is never before 22.00 (but 14.00 on Christmas Day!). Details of permitted opening hours are, of course, posted in the pub.